We have recently updated the archives of Mildred Fahrni, a social activist from B.C. who was active in a number of human, woman’s and children’s rights organizations, including the YMCA, the Women’s International League for Peace and Freedom, and a school for homeless boys in India. 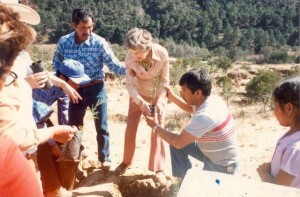 An active speaker and lecturer, she won the Vancouver Peace Award in 1991 before she passed away in 1992. 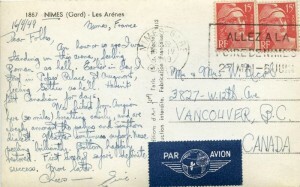 The archives include files on various issues and organizations, including Fahrni’s own notes and other collected documents, extensive photographs of her travels through Russia, India, Japan, Central and South America and the Middle East, and recordings of Fahrni interviewing and being interviewed by others on various human rights and social issues. This collection is one of many that show the impact of British Columbians worldwide. 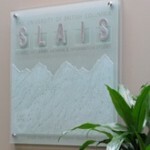 This week’s featured place name and Irving K. Barber Centre room is Slocan. Slocan can refer to a number of geographic features- Slocan Valley, River, Lake, or City. This region is in the West Kootenay area of British Columbia. We are using Slocan to highlight our Japanese-Canadian resources, because the village of Slocan (commonly known as Slocan City) was one of the sites of the Japanese Canadian internment camps during the Second World War. 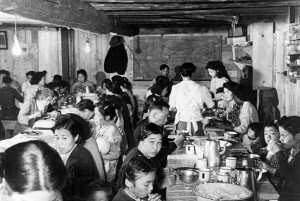 The photographs below are from the Japanese Canadian Historical Photograph Collection, which is digitized and available freely online. There are a number of photographs of the Slocan internment camp in the collection, including photographs of Japanese Canadians arriving at the camp, as in the first photo, and of daily life in the camp, as in the second photo, taken in the dining hall. 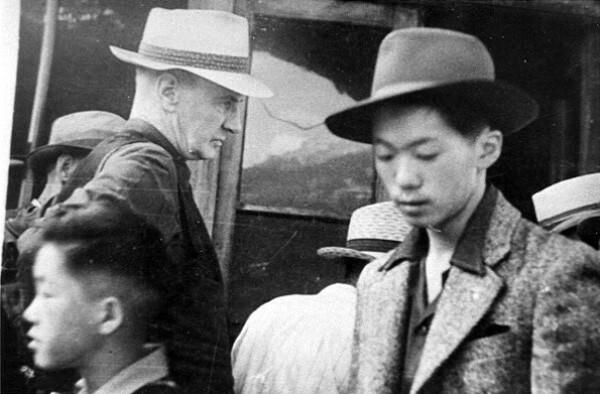 Textual records related to Japanese Canadians in Slocan can be found in the Japanese Canadian Research Collection, in the Yamaga Yasutaro fonds, and also in the Jack Duggan fonds. Jack Duggan was a supervisor for the R.C.M.P. at the Slocan camp. Author Joy Kogawa (whose archives are located in Rare Books and Special Collections) and environmentalist David Suzuki (whose archives are located in University Archives) were both sent as children to the Slocan camp in 1942. 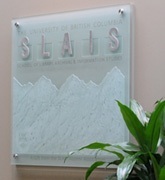 In the Barber Centre, the Slocan room is part of the School of Library, Archival and Information Studies (SLAIS). 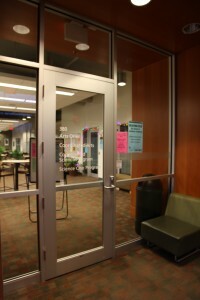 Specifically, this room is a study area frequented by SLAIS’s doctoral students. You can read about the doctoral students and their research interests here. 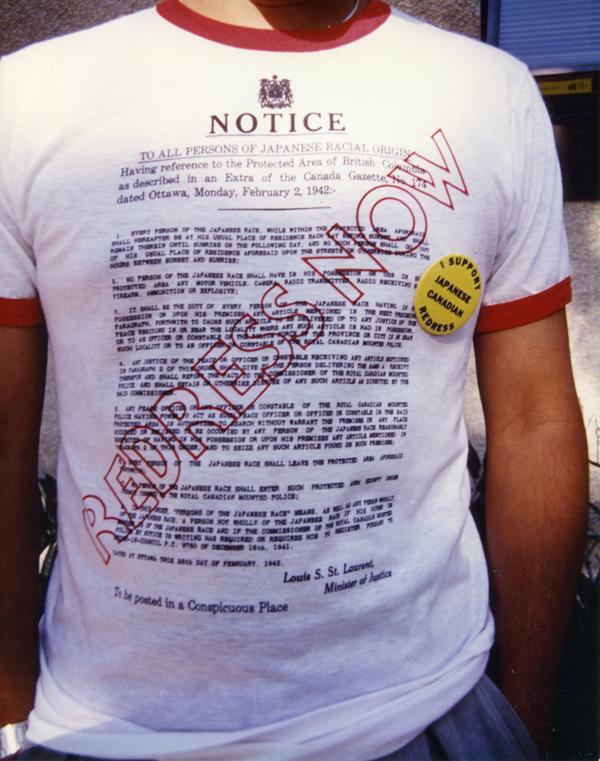 Roy Miki is an author, poet, and literary scholar, but is also well known for his advocacy work concerning redress for Japanese Canadians who were sent to internment camps during the Second World War. The addition to his archives includes records related to writing, teaching and editing, but also a significant body of research on Japanese Canadian history and the issue of redress, including photographs, research notes and audio recordings of oral histories and redress committee meetings. Joy Kogawa is best known as the author of Obasan and Naomi’s Road, read in classrooms across the country. 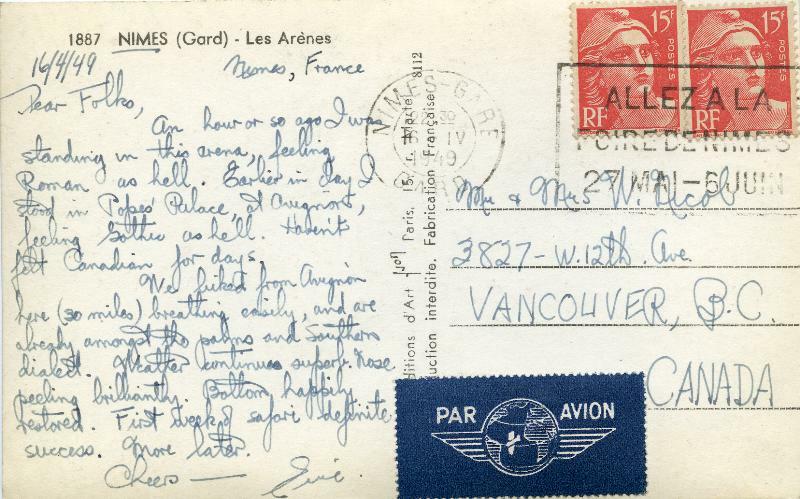 Although she currently resides in Toronto, she grew up in Vancouver before being sent to an internment camp with her family during the Second World War (the Land Conservancy of B.C. is currently preserving her childhood home). The addition to her archives includes records related to several of her novels: Emily Kato, Itsuka, Obasan, The rain ascends, Naomi’s Road, and A garden of anchors. These records include drafts in various stages, correspondence with publishers, and articles and clippings about the novels. David Watmough is a British expat who has been living in Vancouver since 1962. He writes in a variety of mediums: poems, short stories, novels, plays, monodramas, and sonnets. Watmough has been active in the British Columbia literary scene since his arrival, and is also credited with opening the doors for gay and lesbian writers in B.C., as the first openly gay male writer in the province. The addition to his archives includes drafts of short stories, poems and sonnets- see Box 80 in the finding aid. A modestly sized but interesting collection has been added to Rare Books and Special Collections- the Fuller family fonds contains the records of a family of musicians- Rosalind, Cynthia and Dorothy Fuller were the talent, brother Walter acted as their manager. 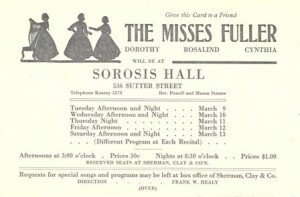 The Fuller sisters originated from Dorset, England, but these records are from their American tour in the mid to late 1910’s. 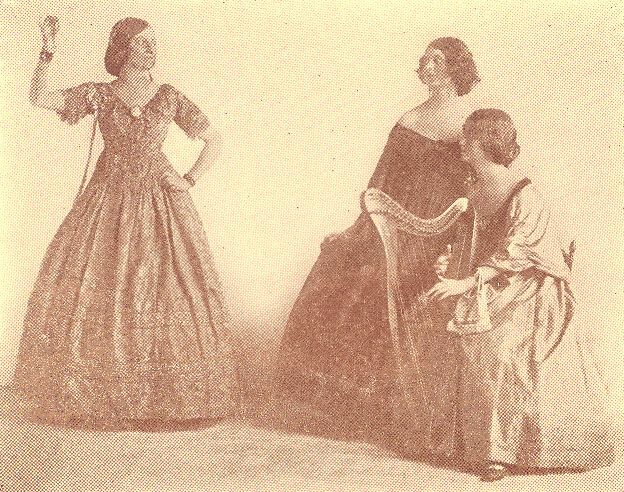 The Fuller sisters performed English, Irish and Scottish folk songs, in Victorian costume and accompanied by harp. Their travels took them throughout America, but primarily in the Eastern and Midwestern United States. Walter Fuller was based during this time New York, and managed their bookings and other business matters. It appears that the family moved back to England after the end of the First World War. The collection contains correspondence between Walter and the sisters, as well as business documents such as contracts and receipts. 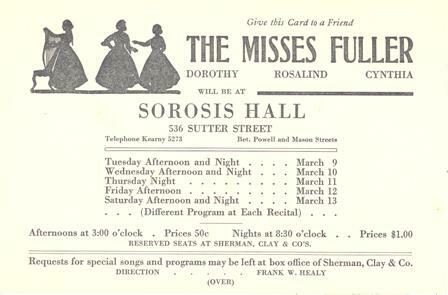 Additionally there are concert programs, reviews, requests from audience members, and printed music broadsides which the family had printed and sold. 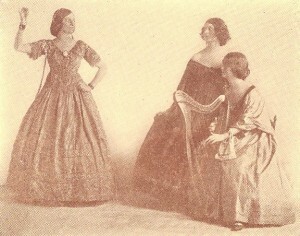 Photographs show the sisters and Walter, and sketches and drawings show some of their impressions from their travels. “As to the question of giving the concert for ourselves or of sharing profits with the Red Cross, I really cannot make up my mind… I am constantly having the idea in my mind, of our giving these concerts for some more innocent sufferers from the war than the soldiers. There is for instance the Blue Cross, which does good things for the horses at the front, and then, or course, there are various funds in aid of children in all the countries.” (From file 1-1). This collection came to Rare Books and Special Collections as part of the Phillip J. Thomas Popular Song Collection, which consists mostly of sheet music and books about popular forms of song, including ballads, folk music, hymns, work songs, and more. In mid-November, our featured place was Moresby Island. It was interesting to learn that there are actually two Islands with the name Moresby in British Columbia. One of those Islands named Moresby Island is located in the Queen Charlotte archipelago. Our featured place this week is Sandspit, a small community of approximately 400 people, located on the northeastern tip of Moresby Island, near Spit Point. Situated between two beaches– Shingle Bay Beach to the west and Shell Beach to the south-east– Sandspit is the only settlement on Moresby Island. Located on a long peninsula of sand and gravel, Sandspit has been home to the Haida people for thousands of years. The town today is sustained by logging, transportation (it has the largest airport on Haida Gwaii) and tourism. In Rare Books and Special Collections, we do not have a lot material on Sandspit. So, to search for archival records related to Sandspit, or other small communities in British Columbia, we recommend that you try searching MemoryBC.ca, a portal where you can access descriptions of archival materials preserved in repositories throughout the province. If you search for the keyword “Sandspit”, you will retrieve records from the Haida Gwaii Museum at Qay’llnagaay, located on nearby Graham Island. Room 381, the Sandspit Meeting Room, is named after this important community in British Columbia. 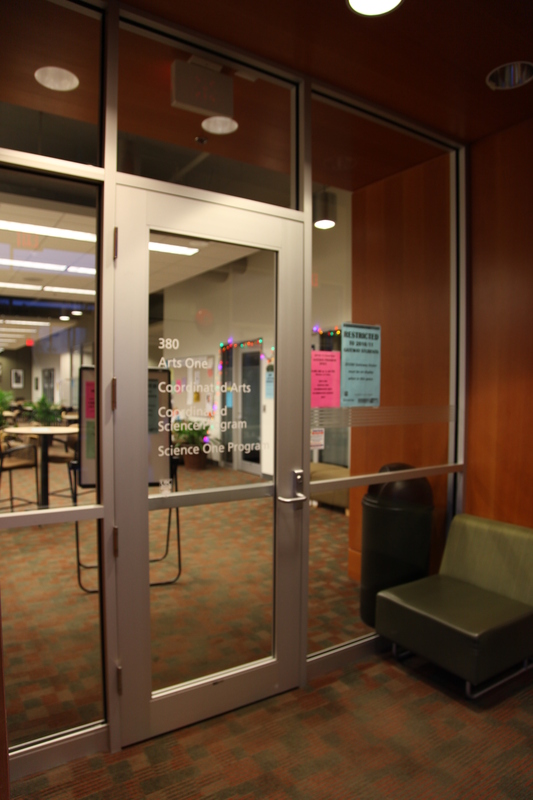 Located on the third floor of the Irving K Barber, this meeting room is part of the Gateway Programs: Arts One, Science One, Coordinated Science and Coordinated Arts. A while back I posted an iPhone app which some researchers use to keep track of photographs they take of documents they’ve consulted in archives. 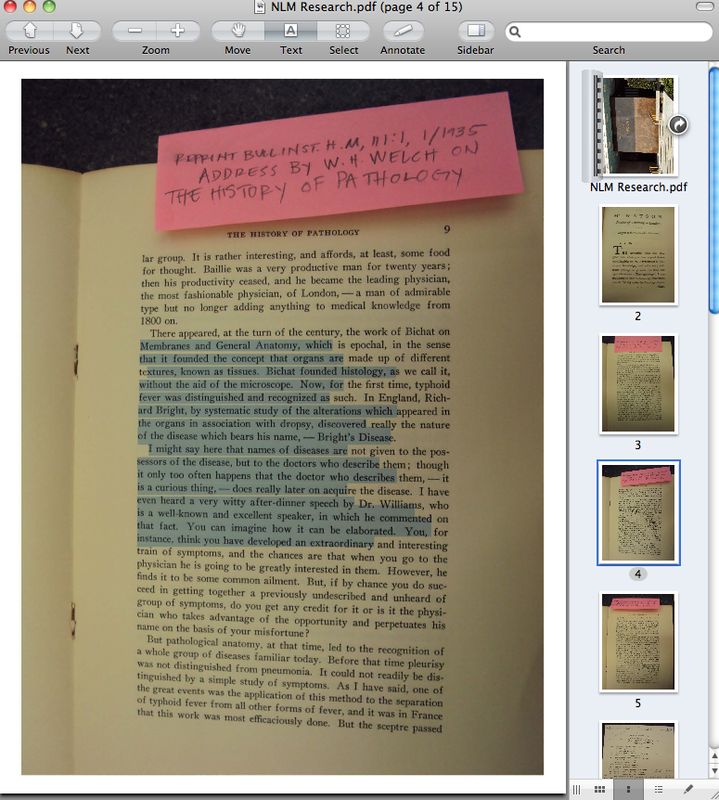 Miriam Posner, a colleague from Emory University libraries (who I met at the Digital Humanities Summer Institute a couple of summers back) has posted to her blog steps for taking your photos, converting them into searchable PDF documents, and saving them for future use in Zotero. You can read her full tutorial here. It’s specific to Macs. 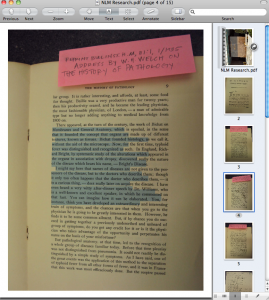 Note how Miriam includes the full citation of the item she is using on a piece of note paper (NOT a post-it note though!) in every photograph she takes. This is a great idea. Another suggestion when using archival material is to start by taking a photo of the box label, and then the file number, before photographing any documents from inside the box so that you can re-trace your steps. You will also find this tutorial linked from our Archival Material research guide. Thanks Miriam! 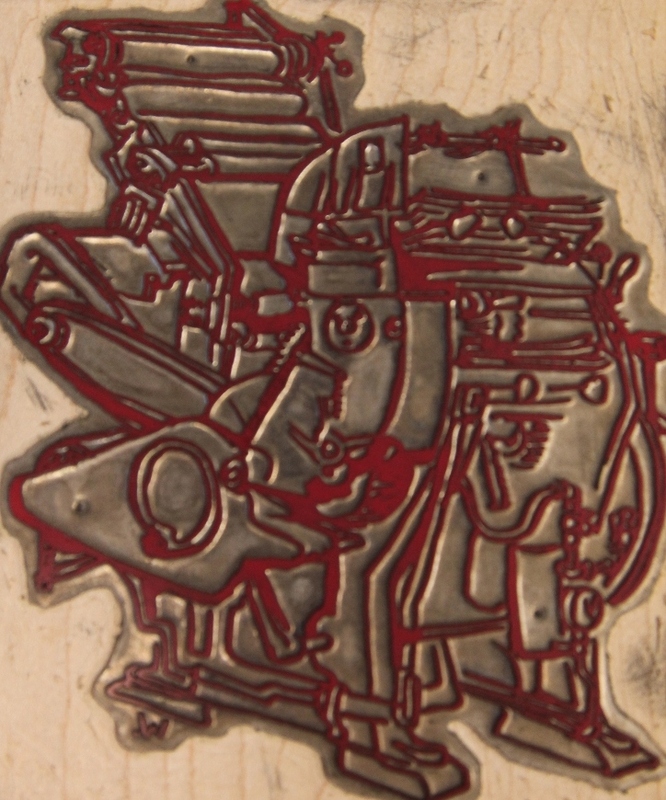 We’re thrilled to announce that Rare Books and Special Collections is now the home of the archives of Heavenly Monkey letterpress and binding studio. We have been long-time collectors of the output of Heavenly Monkey (search the library catalogue) and now you can use the archives to understand these beautiful publications from start to finish. Heavenly Monkey is the imprint of publisher Rollin Milroy, and grew from his first press called A Lone Press in 1999. 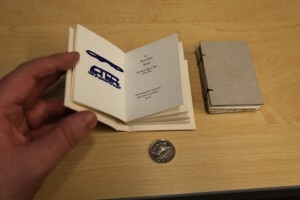 Heavenly Monkey is dedicated to the use of techniques and materials traditional to the fine book arts- handmade paper, letterpress printing and fine bindings. Its catalogue is eclectic; according to Milroy, he prints things he think he would appreciate having on his own book shelf. Heavenly Monkey has collaborated with an impressive group of authors, designers bookbinders and publishers, including Robert Reid, Jim Rimmer, Barbara Hodgson and Claudia Cohen. The archives contain everything you would want to see to understand a Heavenly Monkey book from start to finish, from setting copies, layout schematics, dummies, impressions, printing blocks and plates and correspondence with collaborators. The collection was catalogued by one of our student archivists, who described the process as being “like Christmas-” every little package contained something new and wonderful to explore. Stay tuned- soon we will have available a copy of Heavenly Monkey’s most recent publication, The WunderCabinet, by Barbara Hodgson and Claudia Cohen. It is a truly remarkable collaboration. To find out how Heavenly Monkey got its name, you’ll have to come to Rare Books and Special Collections to see the Heavenly Monkey’s 2002 Christmas card- box 2 file 3.